Mike Moore | The Journal Gazette Wayne high school junior Craig Young, left and Carroll senior Justin Becker compete in the 100 meter run during the 2018 IHSAA Regional held at Indiana Wesleyan University on Thursday. 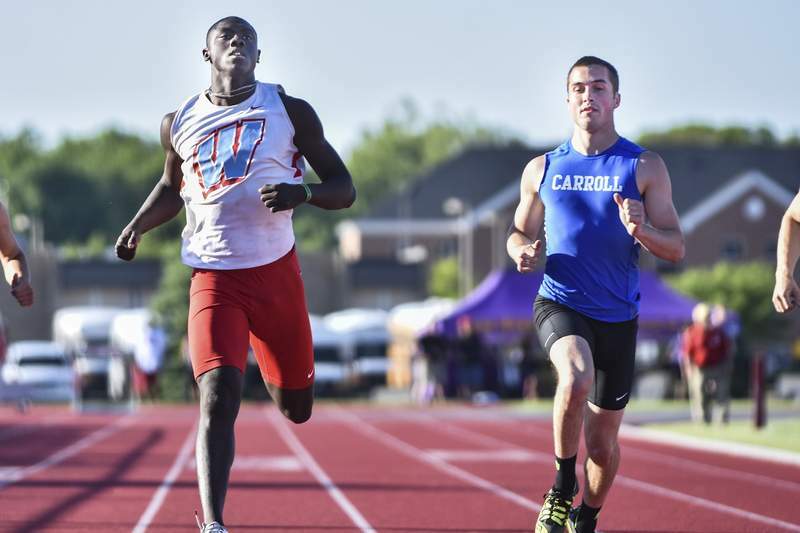 MARION — The unsung heroes of the Carroll boys track team made a huge impact as the Chargers won their fourth straight Regional championship at Indiana Wesleyan on Thursday. Carroll won 92.33-68.83 over runner-up Northrop, a 23.5-point differential. Sure, Justin Becker did his usual thing with wins in the 100 (10.60, new school record), 200 (21.83) and anchored the Chargers to a second-place finish in the 400 relay (42.39) behind Marion (42.32) and Connor Goetz finished second in the 1,600 in 4:12.32 and broke Jacob Schmeling's school record in the process. He also finished under the previous regional record, now held by first-place finisher Jesse Hamlin of Snider (4:12.13). "It's easy to focus on Justin and Connor and those guys, and rightly so," coach David Brooks said, "but those Zach Roberts, Jake Wortingers and Caleb Keeners and Ben Maranos of the world that don't get a lot of attention sometimes. Points count in every event and they got a lot for us tonight." The four specified by Brooks combined for 24 points as Roberts finished fourth in shot put (51-2.5) and eighth in discus (145-3), Wortinger and Keener combined for nine points in pole vault finishing tied for fourth (13-4) and Ben Marano finished second in the 300 hurdles (38.49). "According to what I have, we scored in every event," Brooks said, "so that's always rewarding to see." This year's senior class doesn't feel any pressure to match last year's success (state title in the 400 relay). The regional meet was already a success with the 400 relay setting a new season best, even with a less-than-perfect first handoff. "We're trying not to define our season by last year," Becker said. "This is a new season, new team and we're not going to look at this team and say, 'We have to do what that team did.' This is a whole new team and we're focusing on one meet at a time. We (season) PR'ed in the 400 relay in this meet for our team. That was huge. We have to control what we can control every single meet." Northrop won the 3,200 relay in 7:53.08 that included legs by Jalen Royal who won the open 800 in 1:54.27 and Jack Brokaw who finished second in the 800 (1:55.96). Bruins' Shaton Vaughn won the 110 hurdles (14.58) and 300 hurdles (37.74). Brokaw, Vaughn and Royal were joined by Jayce Phillips to win the 1,600 relay in 3:17.17. "For the 110 hurdles there are some things I can work on for that," Vaughn said. "Because in the middle of the race, I was kind of sloppy and it almost cost me. For the 300 hurdles, I have to stop over-thinking and just run. For the 1,600 relay, I just have to run hard and push through my limit, hopefully help my team win it all." Concordia's Reece Gibson won the 3,200 (9:16.33), Churubusco's Sam Wood defended his regional title in the pole vault, clearing 14-4, Brayden Simmons won discus (169-4) and Garrett Horn won shot put (54-6.75) and DeKalb's Isaac Brown won high jump (6-4). Oak Hill's Tahj Johnson won the 400 (48.98) and Sammy Sommers won long jump (22-3.25). The state championships are scheduled for 3 p.m. June 2 at the Robert C. Haugh Track and Field Complex at Indiana University in Bloomington.